Look at that form! An Olympian in the making! Our next Backyard Olympic events are fun for all ages. 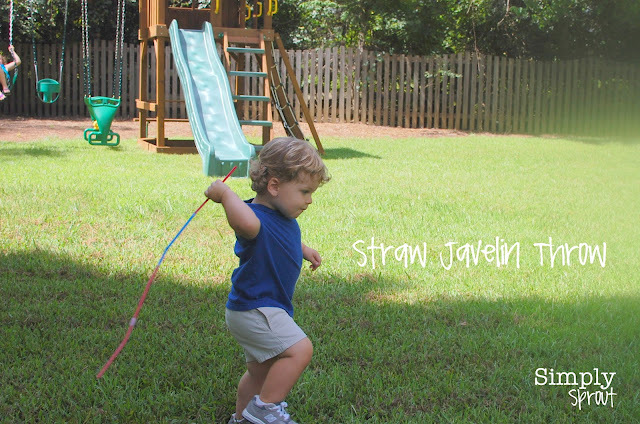 We continued with the straw javelin throw. I pulled out some kid sized straws and had our littlest athlete count out four of them for me. The older competitor practiced her fine motor skills by taping them together. 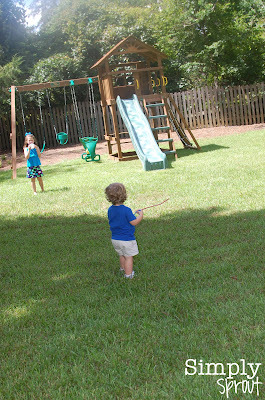 It was a load of fun watching them run and try to throw the straw javelin. This picture is a little fuzzy probably due to my laughing! The cousins then tried to throw it back and forth to one another, and eventually like all good little boys it became a sword. In the meantime we put on our thinking caps on to see what would make our javelin go further, and we used an additional straw as a non-standard tool to measure the distance it soared through the air. Just like any other activity that you plan for your children or students, things don't always go the way you imagined. Remember that children don't care. They just want to learn and have fun doing so! Make the most of the few minutes that you spend here and there explaining why something did or did not happen. I can remember my Dad always saying, "for every action there is an opposite and equal reaction." It might not have meant much to me the first couple hundred times, but the everyday science behind this theory eventually settled in my brain. Now I'm lucky enough to teach it to kids everyday! We left our "messy" game until the end. It was time for cotton ball shot put. 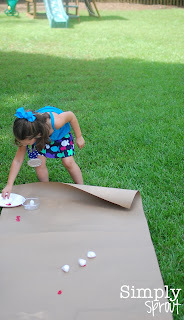 I rolled out some brown craft paper in the yard, got a bowl of cotton balls, and a paper plate with some washable paint. Dip the cotton ball in paint and throw! After the Olympians throw several cotton balls each (if you have multiple kids, try using different color paints) have them do some measuring. 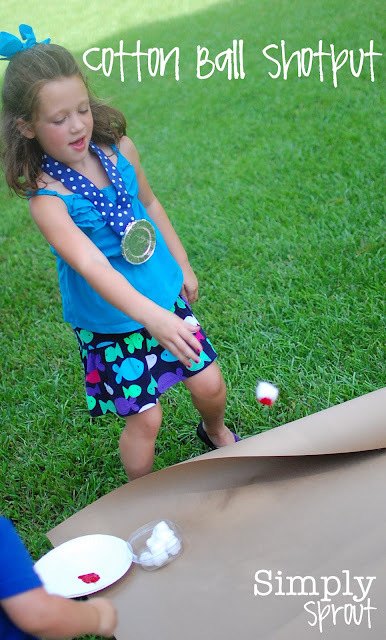 Who threw the farthest, how far was it between cotton balls, what is the average length of one throw? For younger kids they can measure and make designs out of their markings. Preschool/Early Elementary: Encourage your young ones to extend their learning by practicing their measuring and math skills as mentioned above. In preparation for closing ceremonies you could have them do a journal entry about their Backyard Olympics. On a piece of paper write I love the Olympics because ______________. Have them write or dictate what they can and draw a coordinating picture. Middle/Late Elementary: As mentioned above the cotton ball shot put is a great use of math skills for your middle and upper elementary students. Record the measurements of the different paint spots and practice finding the mean, median, and mode. A journal entry about why friendly competition is important, or if they are excited about the 2012 Olympics in London, would be a great segue between your Backyard Olympics and the start of the real ones next week. Tomorrow we will be wrapping up Simply Sprout's Backyard Olympics with closing ceremonies. So grab your togas and torches and we'll see you soon!